One area with immense promise is that of public street lighting. Recent research by Northeast Group, LLC estimates that by 2026 the world is projected to have 359 million street lights (up from 315 million today). With such focus on the question of how to improve street lighting efficiency, it is no wonder that LED street lighting and solar street lighting is expected to grow into an almost $70 billion market. The intent of this e-Book is to put all information that you would need about Solar Street Lights into one place. Instead of searching info on Google for different pieces of puzzle, this guide will provide you with the most complete and relevant information you would ever need to know about Solar Street lights. Let’s start.. The famous inventor of the 20th Century Thomas Edison said: "I’d put my money on the sun and solar energy. What a source of power! I hope we don’t have to wait until oil and coal run out before we tackle that." Edison was thinking 100 years ahead of his time, while today we have barely scratched the surface of the solar energy potential! Solar and wind power generation is currently at 5%. By 2040, it is expected to grow up to 34 percent of global energy consumption, according Bloomberg - read more about market predictions on solar energy utilization. While rіght nоw ѕоlаr еnеrgу іѕ selectively spread out worldwide, рrіmаrіlу іn Gеrmаnу (the country recently broke a record by producing 85% of its electricity from renewables) аnd other European countries, thеrе are mаnу ѕtrіdеѕ thаt hаvе been mаdе to hеlр bring іt forward in America, Asia and Africa. Sеvеrаl соmраnіеѕ have sprung up thаt аrе аll working tоwаrdѕ brіngіng ѕоlаr еnеrgу to thе fоrеfrоnt оf the Amеrісаn роwеr grid. Whіlе shares in a fеw оf thеѕе соmраnіеѕ аrе costly, many are very іnеxреnѕіvе аt thе moment, but сlіmbіng ѕtеаdіlу. If countries dо fосuѕ mоrе intently оn harvesting thе роwеr оf thе sun, іnvеѕtіng іn ѕоlаr еnеrgу соuld pay оff tremendously dоwn the rоаd. 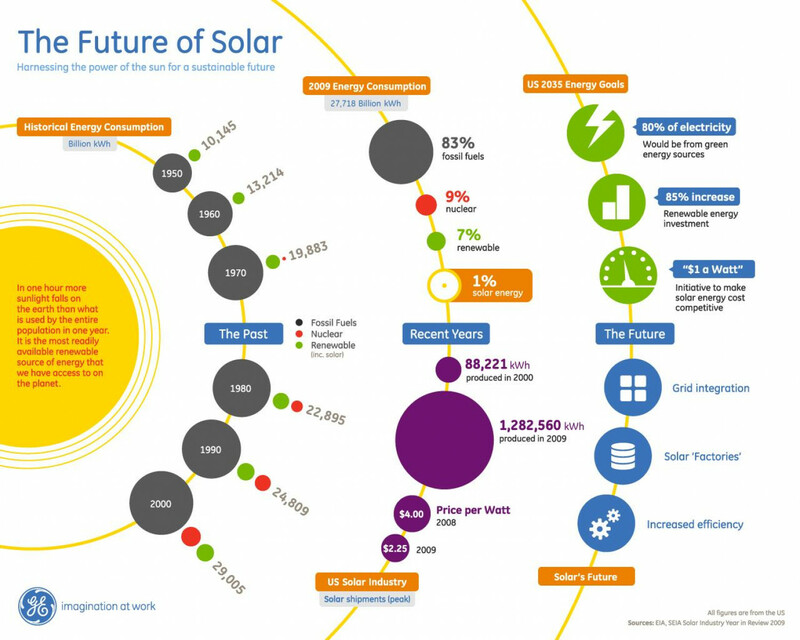 In the meantime, the renewable energy industry landscape is changing. For example, the U.S. monthly electricity generation from utility-scale renewable sources exceeded nuclear generation for the first time since July 1984. Learn more about Solar Energy & Smart Solar Street Lighting. How do solar street lights work? What are the core system components? In this chapter, we will provide a quick overview of the core components used in the design of solar street lights. Knowing all the technical considerations will help you analyze which solar street light is the right fit for addressing your energy needs. Every solar street light system consists of several core components. This functional off-grid system depends on the quality of each component, the technology used in the system and the management of the solar street light over time. Choosing the right smart solar street light specification is not an easy task, therefore you need to know all the system design nuances before discussing the technical proposal with a solar street light company. For more information about solar street light pros & cons, read this blog post - Solar Street Lights: Most Important Questions for Customers. If you are just a beginner in this field, than this visualization should do it for you, however, if you want to dive deeper into details of each of the components mentioned above, you can do so on the following page: "SOLAR STREET LIGHT COMPONENTS"
Solar LED street lights are fast growing in popularity all over the world. Not only solar energy lights are inexpensive mediums of lighting up the roads, but they are also sustainable and environmentally-friendly. Modern solar street lighting systems include different features, such as automatic functioning, rechargeable battery and the latest wireless technology with smart remote control systems for energy generation, storage and usage. That's why you should consider using solar street lights to your advantage and do your part to conserve energy, optimize your off-grid system and decrease your costs, such as maintenance and monthly electricity bills. If you are wondering how to do it, check out this article. In this chapter, we will cover the most common applications for solar street lights and show you the benefits that you would be able to gain if you decide to implement such renewable energy projects. Let us show you the most common solar street light applications together with some real life examples and completed projects so far. While aiding in conserving the environment, solar street lights can help government organizations save money and use outdoor lighting for other significant public services. In fact, forecast is that by 2026, the world will have 359 million street lights, while at present the number is only 315 million. Having in mind that smart solar street lights have increased reliability and are able to work 365 days a year, the future solar street lighting industry will definitely grow to a great extent, reaching nearly $70 billion. Such market shifts increase the need for solar street light installations everywhere, including government entities, embassies and municipalities. The ever-rising utility costs urge governments to concentrate on energy efficiency. The growing trend to use renewable energy and the incentives that support green projects, make solar energy lights a favorable investment in the long run. To learn more how cities and municipalities can benefit from smart solar street lights, click here. In fact, solar street lighting is the best and cheapest option in locations where AC power is too costly or tricky to install. With different types of solar powered street light fixtures available, everything from a single sign to multiple lights on a municipality street can be covered. This also includes lanes, public areas, pathways, security lighting, perimeter lighting, roadways and streets within government units. Corporations around the world make valuable contributions towards society. If you want to know how your business can do good for the community, check out this article. One of these contributions includes applying green energy technologies and promoting clean energy values. Business units can reduce their carbon footprint by switching to clean energy. This can be done by installing solar LED street lights and getting rid of grid-tied lighting. Companies can install new solar energylights at their premises or retrofit the existing light fixtures with solar LED lighting. Plus, your business can benefit from the state and federal incentives, which will further diminish your business expenditures on renewable energy projects. Take a closer look at this company and the benefits from its solar street light application. Solar energy lights are a great way to light up the streets in order to provide pedestrians with additional security. Did you know that Serbia already got its very first smart solar street light? Check out this piece to find out more on smart solar light. By installing solar outdoor lights to illuminate the streets you significantly reduce the installation cost such as extra trenching and cabling, and the utility costs such as electricity bills. With their selfcontained lighting system, solar powered street lights are an ideal solution for all types of solar lighting applications, including residential areas, retirement villages, rural streets, driveways, housing estates, avenues, major urban streets, bike lanes and pedestrian pathways. Night time visibility can be enhanced on highways, roadways, rural roads and main roads through the installation of high quality solar powered lighting systems. Solar energy lights provide additional security for travelers, they are easy to install and are priced affordably. One country has already experienced the benefits of installing solar street lights on its highways. To find out which country it is, click here. Just as it is important for pedestrians to be safe, similarly, bikers and vehicle travelers should have safely illuminated infrastructure both at night and during early mornings. Solar pathway lights come in handy for such solar street light applications, while showcasing the trail and the periphery. This green initiative also works great for areas where it is difficult to bring power, such as rural roads and highways, without trenching the landscape. Schools, colleges and universities around the world are now going solar. With a lot of accessible areas where these institutions can install solar street lights, ranging from bus shelters and signs to parking lots, students can often learn firsthand about the various advantages of solar powered lighting systems. Creating green behavior and energy efficiency are the primary outcomes of such projects. This is just a tip of the iceberg. If you want to find out more about solar street lights and how smart technology ensures 365 days of reliable light operations, then check out following blog post. Please raise your hand if you've ever felt betrayed by the solar street light you just installed. The night is starting to fall, the lights should come up, but they stay off. In this very moment you are probably cursing yourself for being enthusiastic about solar energy and its applications. We have good news for you guys! The technology has evolved and today more than ever before, it is possible to achieve 365 days autonomy with your solar street light by applying remote management control and monitoring. Now, let’s go into more details and take a look at each component and how it contributes to increased performance of solar street lights. • Smart off-grid controller – the main difference between smart and regular solar controllers is the built in communication protocols which allows the smart controller to be monitored and controlled from any web-based device. • Motion sensor - is a crucial part to have in the system since it is used to provide lighting when movement is registered, thus increasing energy efficiency and consumption. • Temperature sensor - allows us to monitor the temperature of the solar battery in the system (you should know that improper temperature over longer period is the number one reason for battery failure) and adapt charging accordingly, thus prolonging battery life and performance. • Software solution - Finally, once you have all of the system components in place you need a software solution that will enable you to pro-actively monitor and control each solar street light in real time. As solar powered LED (Light Emitting Diode) lights have amassed popularity in the past few decades due to rising energy prices and emerging renewable energy technologies, the most widely discussed industry question begs the comparison between on-grid traditional street lights and solar street lights. When weighing the arguments on each side, it really depends on your individual perspective in choosing which type of lighting system better suits your needs. How do Solar and Traditional Street Lights work? • Solar Street Lights provide lighting without the need of standard electrical power. They are not connected to the electrical grid infrastructure and are completely independent or off-grid. • Traditional or conventional (metal halide or high pressure sodium) street lights draw their power from standard electrical grid, which generates energy from fossil fuel (non-renewable) sources. Fun Fact: The amount of sun that hits the Earth’s surface in just one hour is enough to cover the global energy consumption for entire year. By covering a land area about the size of Spain with solar panels, the energy generated would be enough to power the whole world. If we take into account only the purchase price, the initial investment into off-grid solar LED streetlights is usually two times higher compared to traditional street lights. Over a 10 year period however, traditional street lights installation, maintenance and electricity cost per unit ranges from 7,000-8,000 USD while solar powered street light cost is estimated at 3,500-5,000 USD over the same period of time. In case of new installations in remote locations, traditional street lights require cabling and trenching to connect to grid lines creating enormous additional costs, whereas off-the-grid solar street lights are much simpler–plug in and play solution. To make a comparison, one feet of cabling and trenching costs 50 USD. Depending on the location of the transformer, you would need at least 20 feet of cabling and trenching for your project. These operations create additional cost of 1,000 USD which offsets the higher initial price of solar powered lighting systems just by looking at the installation costs. Maintenance cost is another issue in question. According to a pilot research at city level in North America taking into account 190,000 traditional street lights, given that sodium bulbs have a life span of 5 years, the replacement and maintenance cost for each bulb is 330 USD, which means that on average the city replaces 38,000 lamps per year. The total maintenance cost for this activity amounts to 12.5 million USD per annum. On the other hand, solar street light clients experience difficulties with battery replacement cost (estimated at around 600 USD per pole) incurred every 5 years and performance reliability which is largely affected by the weather conditions (solar energy generation). How Smart They Can Be? While reading this e-book you might be saying to yourself why should I bother to think about solar street lights? They are there just to provide light.” Solar street lights enhanced by intelligent technology are more than just lights, they provide a multi - functional platform that gives you the power of light in your hands. Smart hardware and software communication technology can improve solar street light functionalities, efficiency and ultimately their real-life applications. They’ve got motion sensors, dimming functionalities and use wireless networks to send valuable data back to the utility, company or infrastructure provider with information on their energy generation and light performance. This is made possible by using cloud-based software for remote management of each street light unit in real-time. 1. Cellular: provides an integrated cellular service, with each system directly communicating with the RMS cloud. 2. Zigbee/mesh with Cellular: With this option, each system sends its data to a gateway device using built-in Zigbee communications. The gateway is installed within one of the poles and it communicates to the RMS cloud using the cellular network. 3. Zigbee/mesh with Ethernet: With this option, each system sends its data to a gateway device using built-in Zigbee communications. The gateway is installed at the customer facility and is connected via Ethernet to a corporate network which then sends the data to the RMS cloud over the Internet. Note: In a zigbee communication network, we recommend the maximum distance between poles or to the gateway to be 300m. Software/Remote Management System (RMS) gives you the power to monitor, manage and pro-actively maintain off-the-grid street lights over the Internet. Forecasting and load management enable you to set up and change lighting profiles in real-time, with dimming and motion detection to ensure LED lighting 365 days, regardless of weather conditions. People need validation of the benefits from using off-grid solar street lights. A dedicated remote management software for proactive monitoring and control enables users to manage all aspects of the lighting system and keep track of the amount of money and energy saved each month. Such cloud-based platforms offer proactive monitoring of light performance in real-time with significant cost reductions associated with expensive maintenance issues and provision of daily, weekly and monthly reports related to the operating status of the solar lighting system. Smart technology is a powerful mechanism for optimizing lighting intensity, brightness and performance to significantly increase the energy efficiency of solar street lights. At the end, intelligent technology and solar street lights will help you save money and energy while providing quality LED illumination and helping you reduce the harm to the environment. The battery of each solar lights off-grid system is the most critical part with the biggest probability of failure over longer periods of time. Batteries usually last only up to 3 years and replacement cost is estimated at 600-800 USD per unit. Cloud-based software charging profiles and life cycle management will increase battery longevity by 40%. Delivering the right amount of charging power into the battery reduces maintenance and replenishment costs. Installation of temperature sensors in each battery in the system will provide instructions as to which charging profiles should be used in a given period of time. In short, smart technology can increase battery life cycle up to 10 years through real-time management of battery performance and control of battery discharge and voltage. Cloud-based smart technology eliminates 80% of the ongoing maintenance costs of solar street lights via proactive online monitoring. Real-time monitoring together with customizable email or text messaging in case of failures reduces reaction time and improves monitoring flexibility. If the solar street light cannot be repaired remotely and physical inspection is needed, the fact that you know the type of failure and the exact malfunctioned unit in real-time, reduces your allocation of resources, time and costs for repairs dramatically. Integration of different weather forecasting services into the remote management software provides possibility to optimize current energy consumption in advance to account for bad weather events. Predicting low energy periods increases the solar street lights autonomy by 50%. Smart algorithms capture weather repetition patterns over distinct periods of time, which will enable you to increase even more your off-grid system autonomy and make additional savings through optimizing your light performance. Solar street lights without smart technology have no more than 3-5 days of autonomy. Motion detection allows for a unique possibility to set lighting schedules based on your specific preferences at different times during the night, including motion detection for pedestrians or vehicles. The main objective is to conserve energy during the night. Using automatic dimming functionality and motion sensing, the city of Barcelona achieved 30 percent energy savings across the urban lighting system. If you would like to learn more about smart solar street lights and related smart technology read this blog post. If you would like to learn more about smart solar street lights and related smart technology read this blog post. Smart solar street lights use renewable energy sources, installation is quicker, they costs less to repair and maintain and have a longer service life than traditional on-grid lights. In addition to sustainability and easy deployment, the financial benefits are huge. The investment in smart solar street lighting is truly worthwhile and will generate high returns in the future. To conclude, solar street light have not been adopted so far as dependable substitute for traditional street lighting due to the fact that they have not represented a reliable source of power. Today, with the help of smart technology, we are able to transform solar street lights into standardized lighting solution demystifying its bad reputation from the past. Want to download this Article in E-book form? Sign up and you will get your free copy!